CEDAR FALLS — Donna Jean Heisterkamp McGuire, 71, of Gladwin, Mich., formerly of Cedar Falls, died Tuesday, July 17, at the University of Michigan Hospital, Ann Arbor, Mich.
She was born May 21, 1936, in Granger, Minn., daughter of Paul and Addrie Sturchler Heisterkamp. She married James G. McGuire on May 25, 1974. 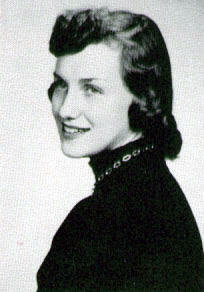 She graduated from Cedar Falls High School in 1954. She was baptized as one of Jehovah’s Witnesses in Des Moines in 1959. Survived by: her husband; two sons, Daniel (Ingrid) Sult of Phoenix and Jonathan (Donna) McGuire of Beaverton, Mich.; four daughters, Michelle Sult of Long Island, N.Y., Melinda (James) Norman of Beaverton and Leah McGuire and Hannah McGuire, both of Gladwin; 12 grandchildren; three great-grandchildren; two sisters, Virginia (Robert) Lund and Geraldine Barritt, both of Cedar Falls; a sister-in-law, Marie Heisterkamp of Cedar Falls; and several nieces and nephews. Preceded in death by: her parents; and a brother, Dwayne. Memorial services: 3 p.m. today at the Kingdom Hall of Jehovah’s Witnesses, Gladwin, officiated by Joel McGuire, a stepson. She is remembered for her beautiful smile and hearty laugh; her love of God, family, friends, nature, art and cooking. She will be dearly missed by all who knew her. FORT PIERCE, Fla. –- Marvin D. Gram, 70, of Fort Pierce, Fla., formerly of Cedar Falls, died Monday, April 23, at home following a short battle with cancer. A memorial service will be held at Fairview Cemetery, 12th and Division streets, Cedar Falls, at 9:30 a.m. on Tuesday, May 29. Fellowship gathering will follow at St. John’s Lutheran Church, 715 College St., Cedar Falls, Marvin is survived by his wife, Norma; children, Lynn, Mitchell and Spencer; four grandchildren; and his brother, Harold. Memorials to St. John’s Lutheran Church, Cedar Falls. WAVERLY — Gary Allen Hilbert, 70, of Waverly, died June 29, at Covenant Medical Center, Waterloo, from complications of a stroke. He was born Dec. 7, 1935, in Cherokee, son of Walter and Frances Blake Hilbert. On June 9, 1956, he married Darlene Austin, and they later divorced. On July 27, 1990, he married Trina McCool, and they later divorced. 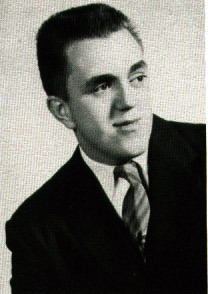 Mr. Hilbert graduated from the Cedar Falls High School in 1954, then attended Gates Business College, Waterloo. He worked at Chamberlain’s Manufacturing Co. as a supervisor from the mid-1960s until retiring in 1992. 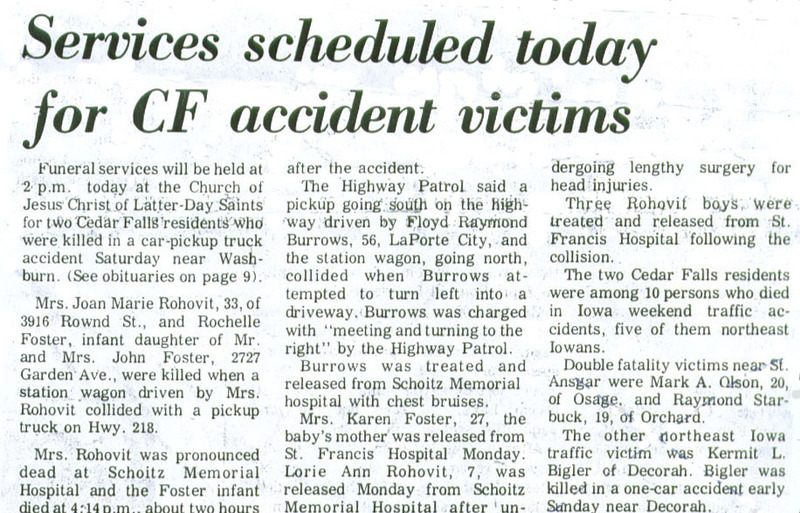 Survivors include: two sons, Barney (Jean) of Waverly and Jeff (Kim) of Cedar Falls; a daughter, Emily Hilbert of Waverly; a stepdaughter, Amanda McCool of Florida; four stepgrandchildren and two stepgreat-grandchildren; a brother, Walter of Davenport; and three sisters, Margaret “Gretchen” (Terry) Stukenberg of Cedar Falls, Eleanor Hilbert of Waverly and Jane Hilbert (Melinda Murphy) of Waverly. Preceded in death by: a sister-in-law, Joyce Hilbert. 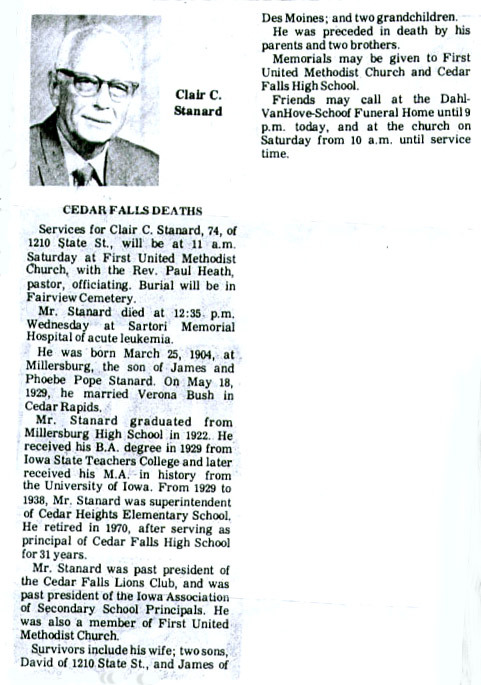 Services: 10:30 a.m. Monday at St. Mary’s Catholic Church, Waverly, with burial in Greenwood Cemetery, Cedar Falls. Public visitation from 5 to 7 p.m. today at Kaiser-Corson Funeral Home, Waverly, with a 7 p.m. public Scripture service. Memorials: may be directed to the family for a fund to be established at a later date. 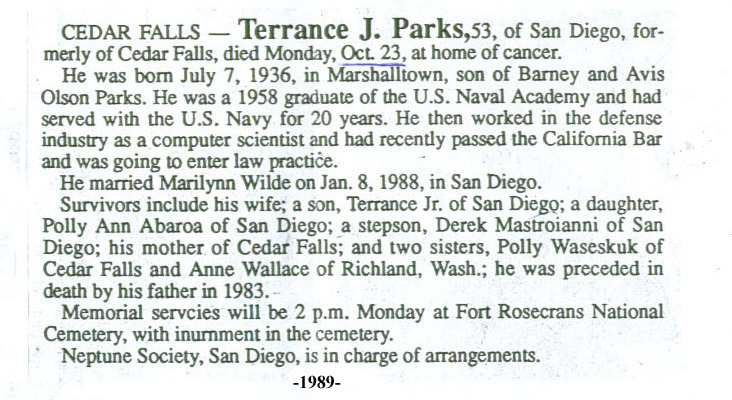 He was born April 26, 1936, in Cedar Falls, son of Roland and Mae Natzke. He married Cathrine Schlenker. Mr. Natzke served in the U.S. Navy during the Korean War as a fire control technician aboard the submarine USS Pomadon, the SS 486. 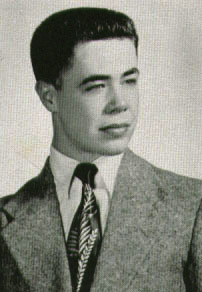 He received his undergraduate degree from the University of Northern Iowa, and his graduate degree from Michigan State University. He taught and designed programs in electrical engineering technology at Jackson Community College, Kirtland Community College and Battle Creek Community College, for a total of 30 years. Survivors include: his wife; four daughters, Cheryl Natzke of Haslett, Mich., Melissa (Bruce) Natzke-Barlow of Portage, Mich., Laura Wright of Jackson, Mich., and Lezley Fritz of Fremont, Ohio; a son, Jeffry (Connie) of Howell, Mich.; six grandsons; a sister, Carol Kaletha of Michigan City, Ind. ; and a brother, Kirk of Waterloo. Memorial services: 3 p.m. April 16 at Westminster Presbyterian Church, Harrisville, Mich., where friends may call for an hour before. Gilles Funeral Home, Lincoln, Mich., is in charge of arrangements. Memorials: may be directed to the church, 201 N. Second St., Harrisville, MI 48740. JEAN ANN CUNNINGHAM Baumgartner, 68, of rural Waverly and formerly of Cedar Falls died of cancer Wednesday, December 29, 2004 at Covenant Medical Center in Waterloo. Jean was born October 26, 1936 at Dundee, Iowa the daughter of Harold & Elsie (Smith) Baumgartner. She married Melvin Cunningham September 16, 1956 at St. John Lutheran Church in Cedar Falls. Survivors include her husband, Melvin of rural Waverly; one son, Dr. Dan (Debra) Cunningham of Montgomery, Alabama; one daughter, Sue (Rich) Burk of Casper, Wyoming; four grandchildren, Kelly & Katie Cunningham and James & Mikey Burk; her mother, Elsie (Baumgartner) Stamp of Cedar Falls; and one brother, Gary (Joan) Baumgartner of Cedar Falls. Jean was preceded in death by her father. Jean Ann had the gentle and creative soul of an artist and was a member of the Federated Flower Art Club. She was a talented painter, and her works were showcased around the area. She loved birds and flowers, and created award-winning floral designs and beautiful gardens around her beloved home in the trees by the river. Jean Ann loved Christmas year-round, and rarely passed a Christmas shop without a trip inside. 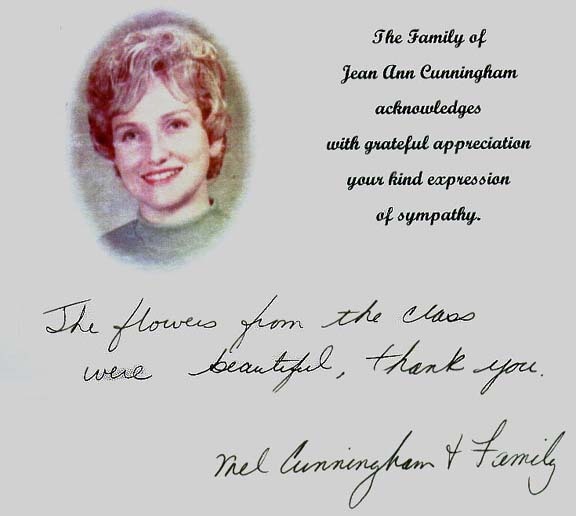 Jean Ann loved her family above all. She was a loving and devoted wife, friend, and partner to her husband, and a mother who gave her heart to her children, leaving them her legacy of love. She built fairy houses with her granddaughters, constructed Play-Doh machines with her grandsons, and enjoyed snuggling on the couch with all of them to read “The Night Before Christmas”. Funeral services will be 10:30 a.m. Monday, January 3, 2005 at St. John Lutheran Church with burial in Fairview Cemetery. Visitation will be from 2 to 6 p.m. Sunday at the Dahl-Van Hove-Schoof Funeral Home and for one hour before service time at the church on Monday. Memorials may be directed to American Cancer Society. Enough monies were contributed that it paid for the flowers and also a $155 memorial. As per family instructions I sent it off this AM on behalf of the Cedar Falls Class of 1954.. The American Cancer Society will send a card to Jean Ann's husband stating this. The above Thank You note I received last week on behalf of the class for the flowers. CEDAR FALLS- Hans C. "Junior" Larsen, 66, of Dike,formerly of Cedar Falls, died Monday,Aug. 6, at Covenant Medical Center, Waterloo, of natural causes. 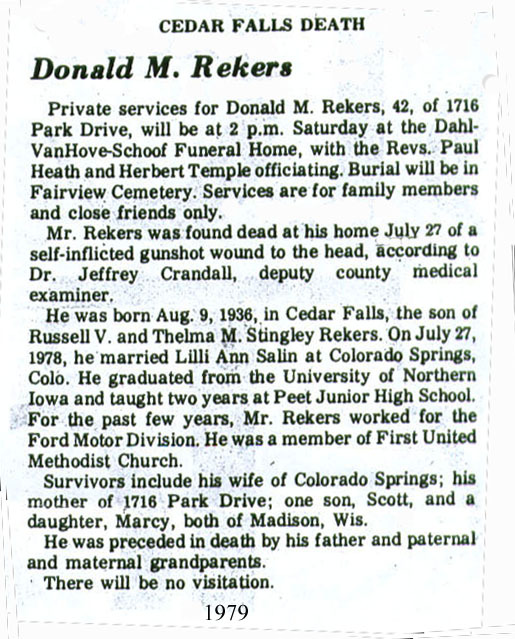 He was born July 20,1935, in Cedar Falls, son of Hans C. and Helena Gerike Larsen Sr. He married Adeline L. Bruns on Aug. 10,1963, in Britt. Mr. Larsen was employed as an inspector at Viking Pump Co.,retiring in 1999. Survived by: his wife; a daughter, Brenda Richardson of Highland, Ind. ; a son, Bret of Dike; two grandchildren; and a sister, Rosie Jacobsen of Rockwell City. Preceded in death by: two sisters, Hertha Brown and Ruth Simerson. Services: 10:30a.m. Thursday at Fredsville Lutheran Church, rural Cedar Falls, with burial in the church cemetery.Friends may call from 1 to 8 p.m. Wednesdayat Richardson Funeral Home, Cedar Falls, with family present from 5to 8p.m. Visitation also for an hour before services Thursday at the church.